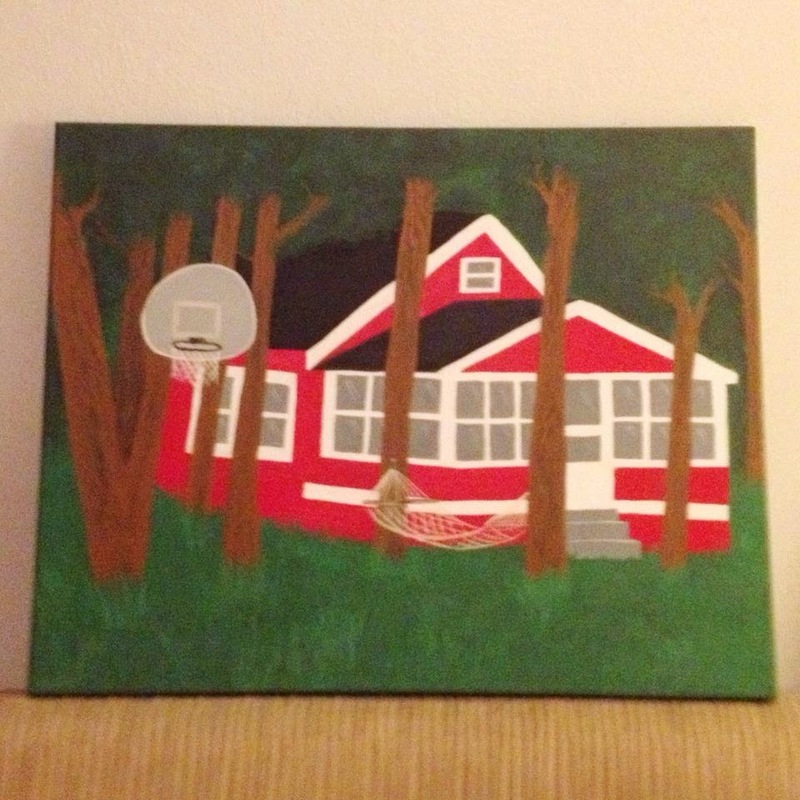 Every year for Christmas, we do a drawing among the adults so you just have to get one person a larger present. 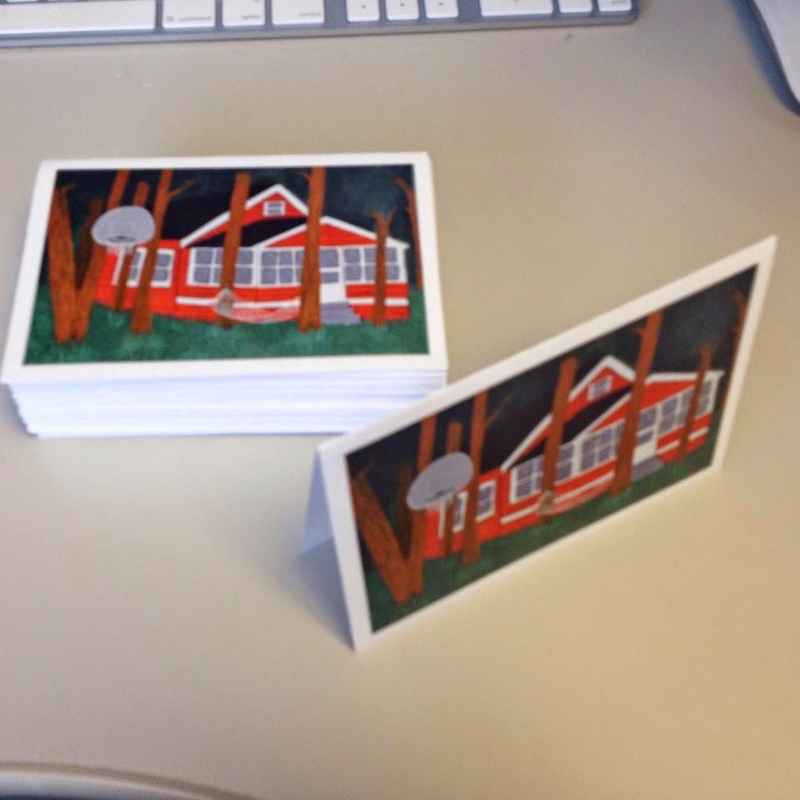 This year, I drew my aunt's name and I decided to do a painting of our favorite cottage in Wisconsin and getting notecards made for her to write to people. It took me about a month or two to do the painting and most of the time it would be sitting there with me trying to decide what needs to be done... Basically, a majority of my creative process is me staring at whatever I'm working on and deciding on what needs to change. It has been a long time since I've really sat down to paint something like this, but as I mentioned in this post, it has been very relaxing and inspiring. 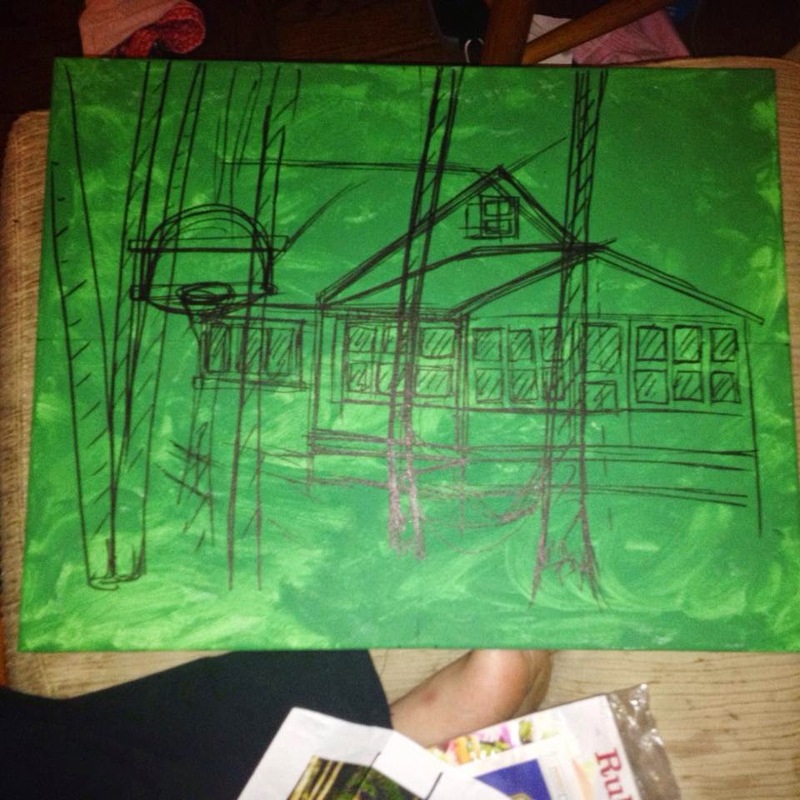 I started out with a layer of green paint and sketched in the general plan. 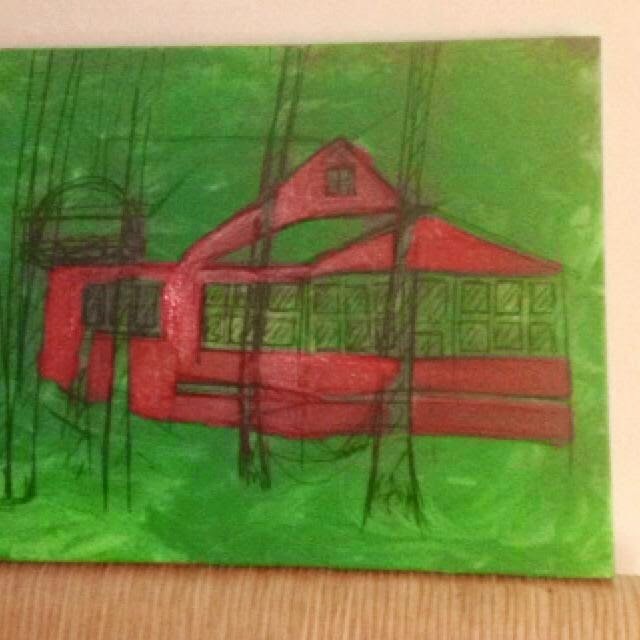 Started with the red of the cottage... looking real good! 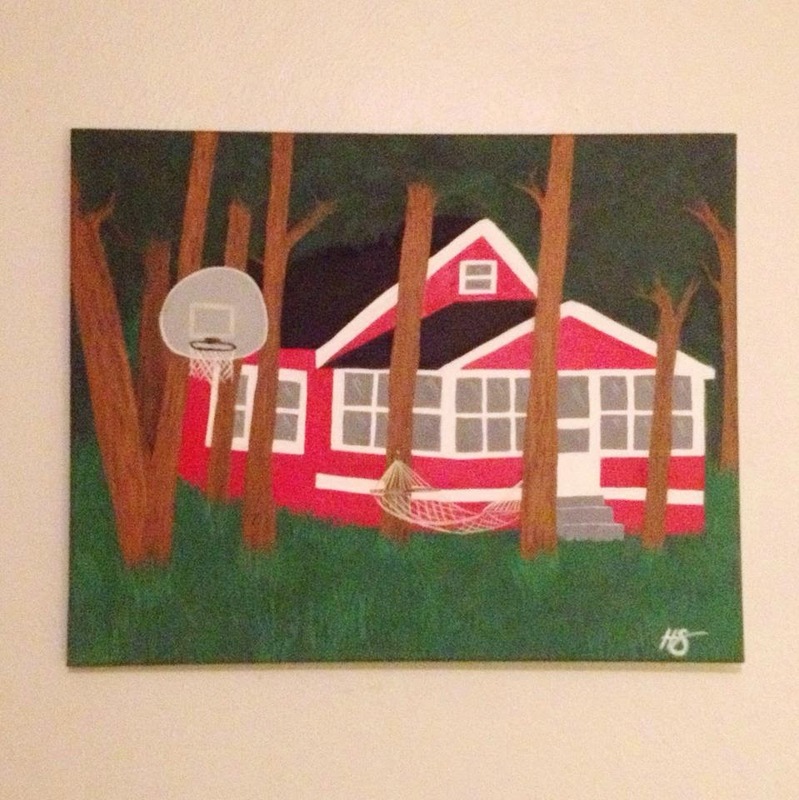 It took me a couple different red paints and quite a few layers to get the right color for the cottage. 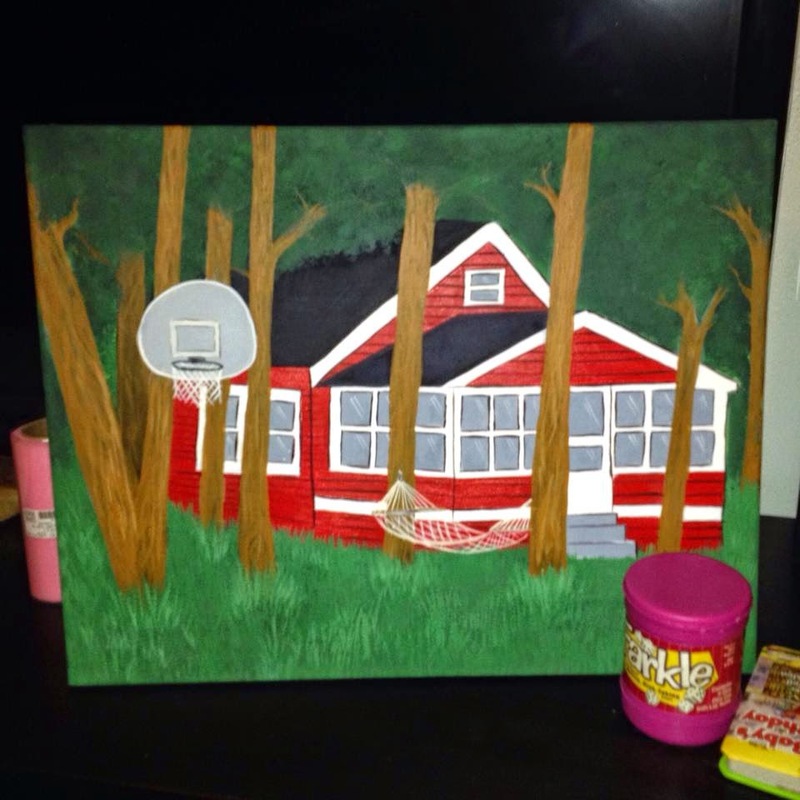 The final perfect color was a red that my grandpa gave to me when he was cleaning out his paints. I felt like that was pretty perfect. 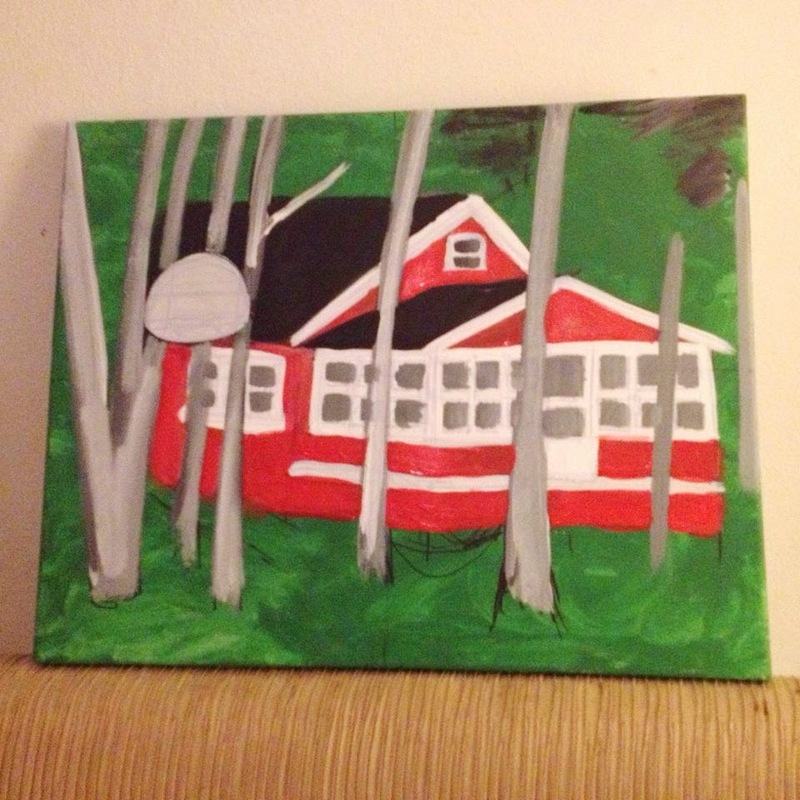 Then I moved onto the rough white trim and some trees. It took quite a few layers to cover up the sharpie, so I probably would have picked something else to sketch it out in hindsight. 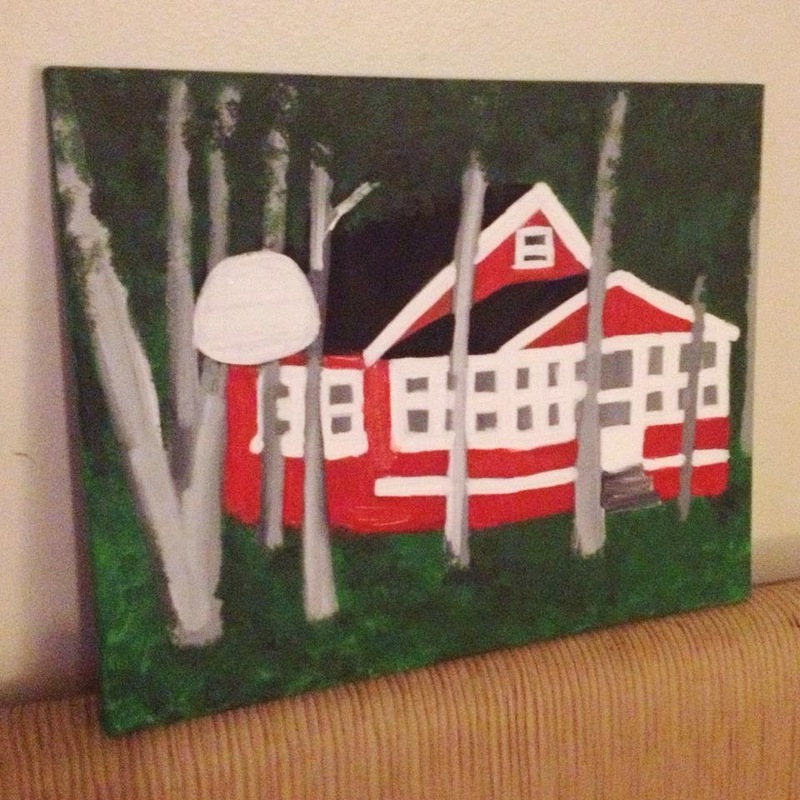 Painted in the windows, made the roof black, and started darkening up the background. Below you can see the picture I was working from. 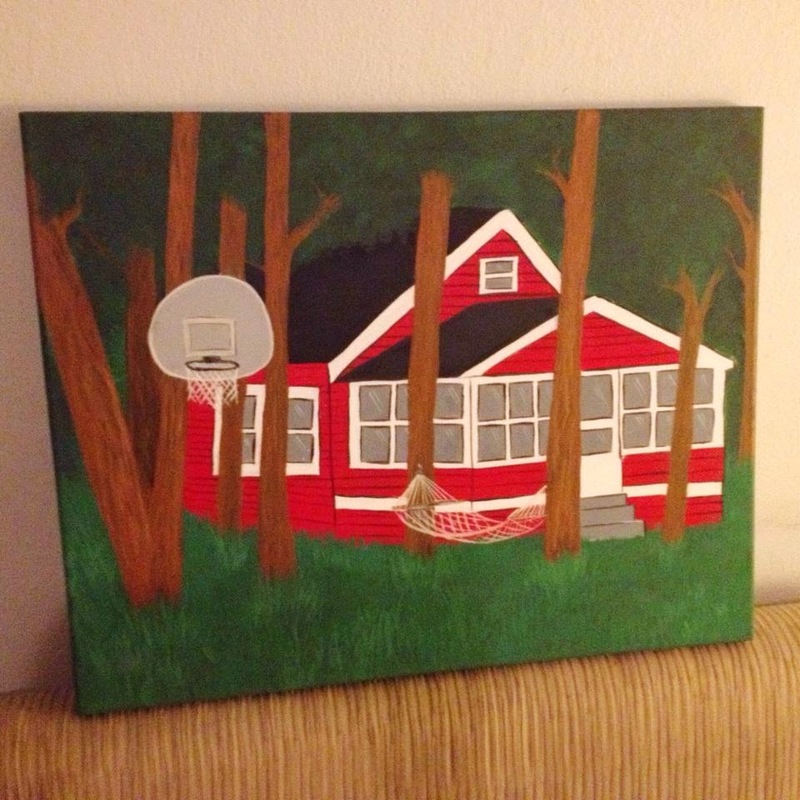 About halfway through my project, I realized that this picture was probably ten years old and we've cut down a couple of those trees and added a different basketball hoop, but generally the picture is still true to today's form of the cottage. 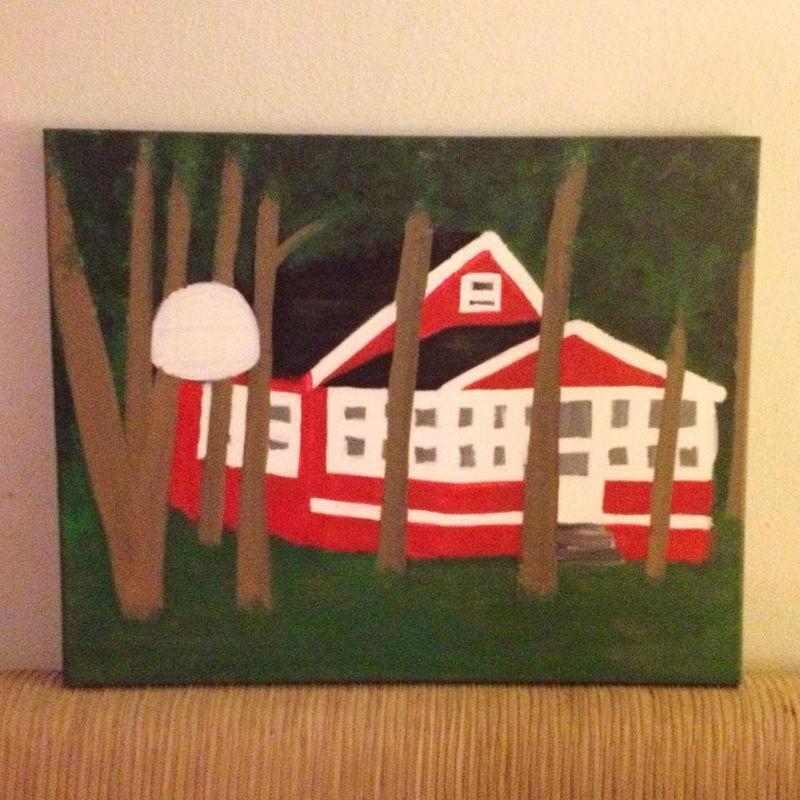 Next, I painted the trees brown and darkened up the background. I paused for a while here because I wasn't really that happy with the brown. I tried switching the trees back to gray and working on the foreground, but then I wasn't happy with that either... so this was where I hit the not-so-great middle ground that one hits in the middle of projects. Okay... back to brown (here you can see the progress of the weaving I was working on). 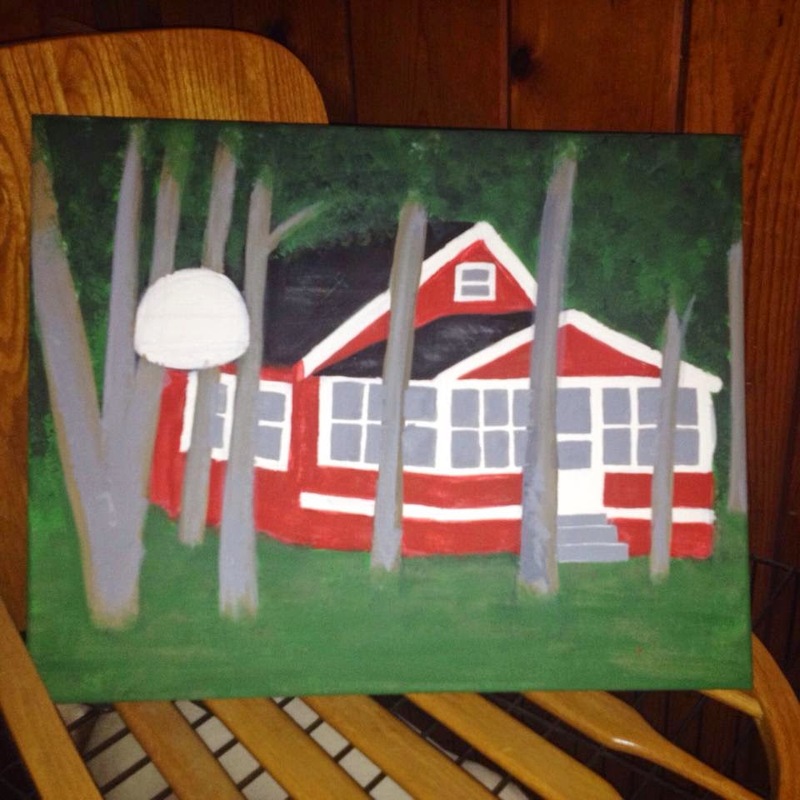 Added in some more texture with the brown, added some more branches, and tightened up the red and white on the cottage. 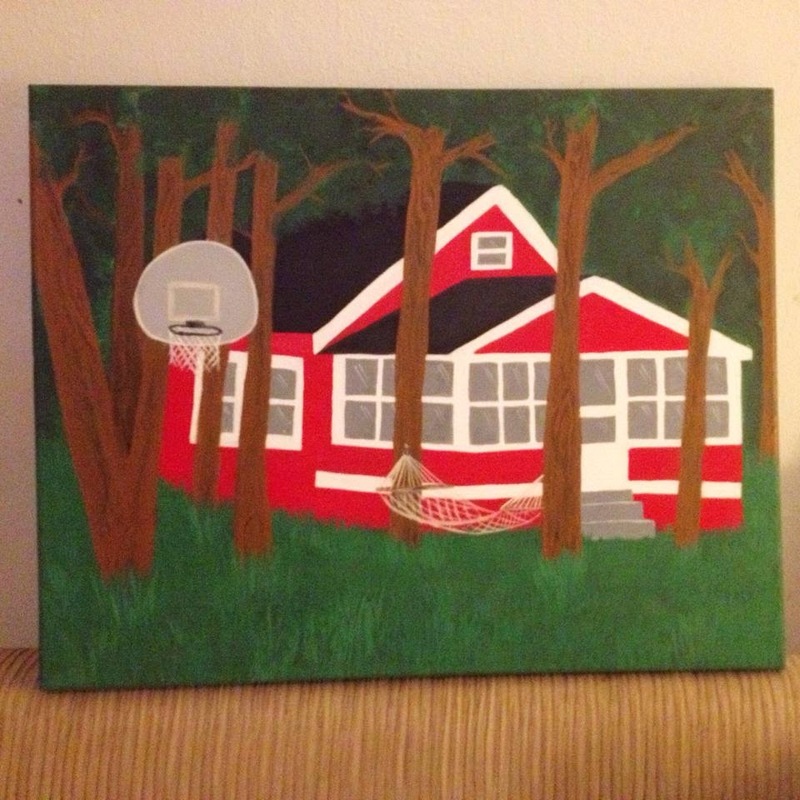 Added in some details on the windows, the basketball hoop, the grass, and the hammock.... and then I danced around with what I wanted to do with the trees (lots of branches? no branches? 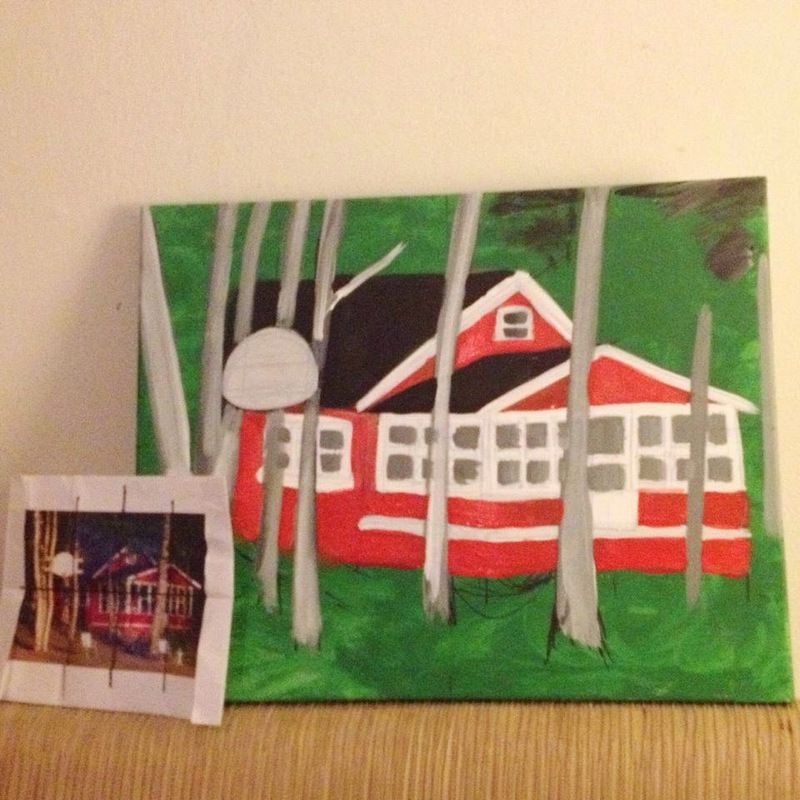 some extending to the top of the canvas?). Added my signature for a brief moment here, but it was completely distracting so I painted over it. 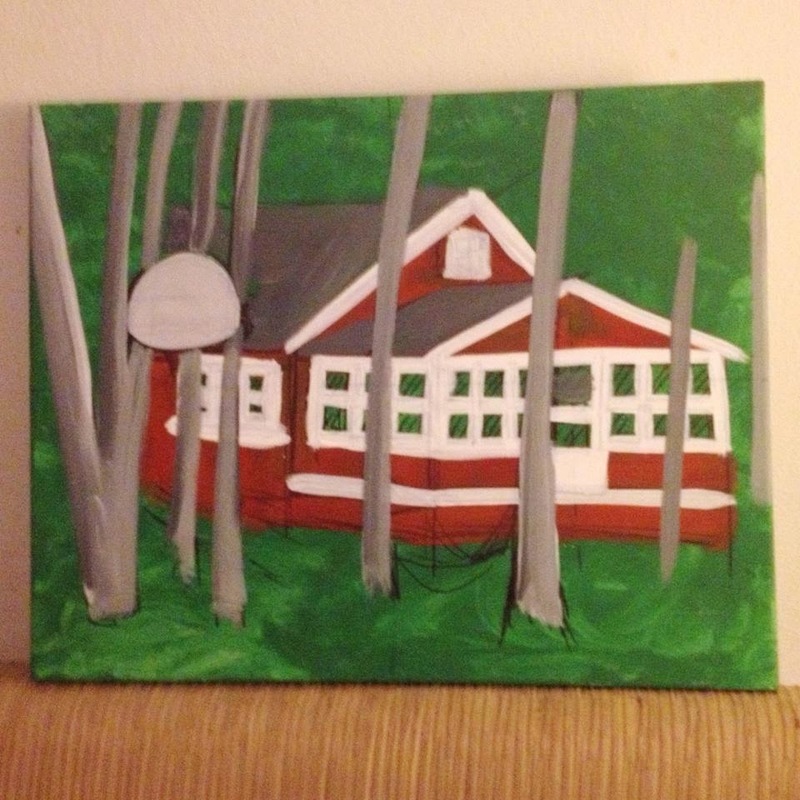 Added in the planking detail and black outlining of the windows and declared it finished. 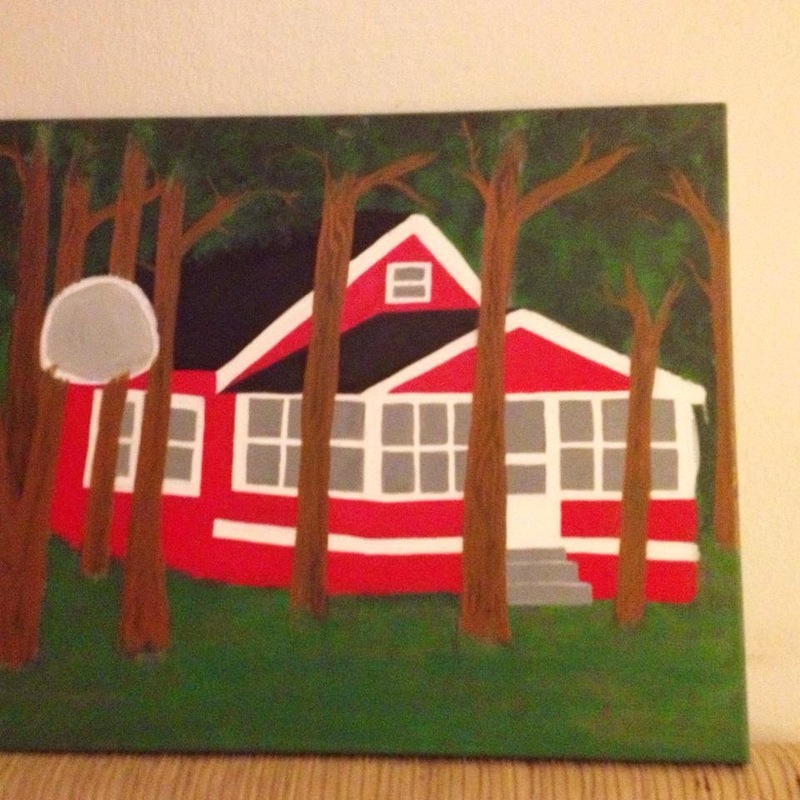 The colors are pretty bright in this one, but you can get an idea of the details in the trees and grass. 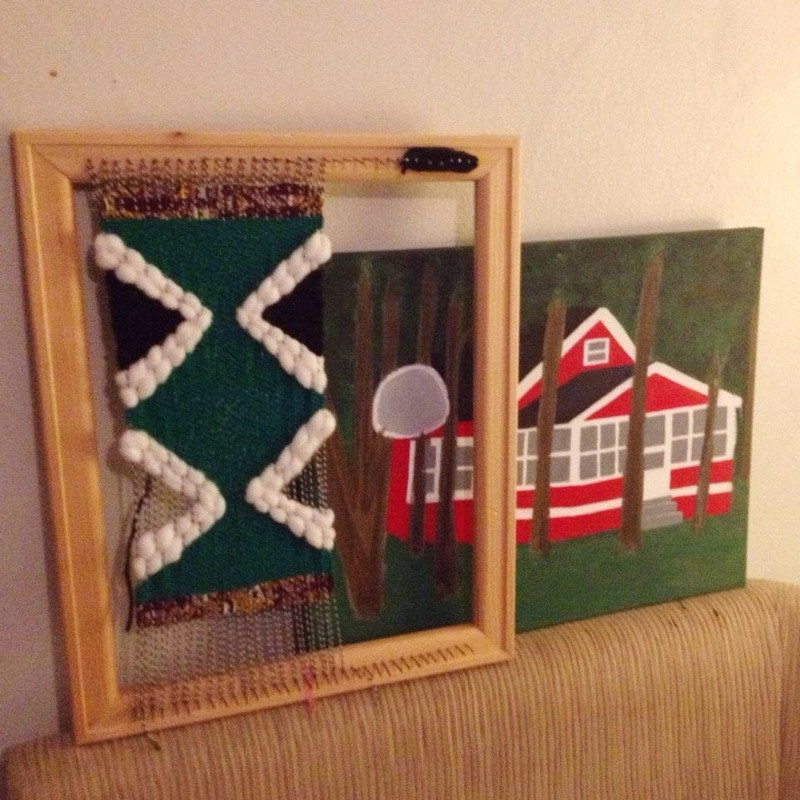 Once I decided I was finished with the piece (is an artist ever finished? ), I took some nice photos to get printed. I tried getting this printed on photo cards from Walgreens and they turned out terribly and I started to second guess my whole gift idea/painting. 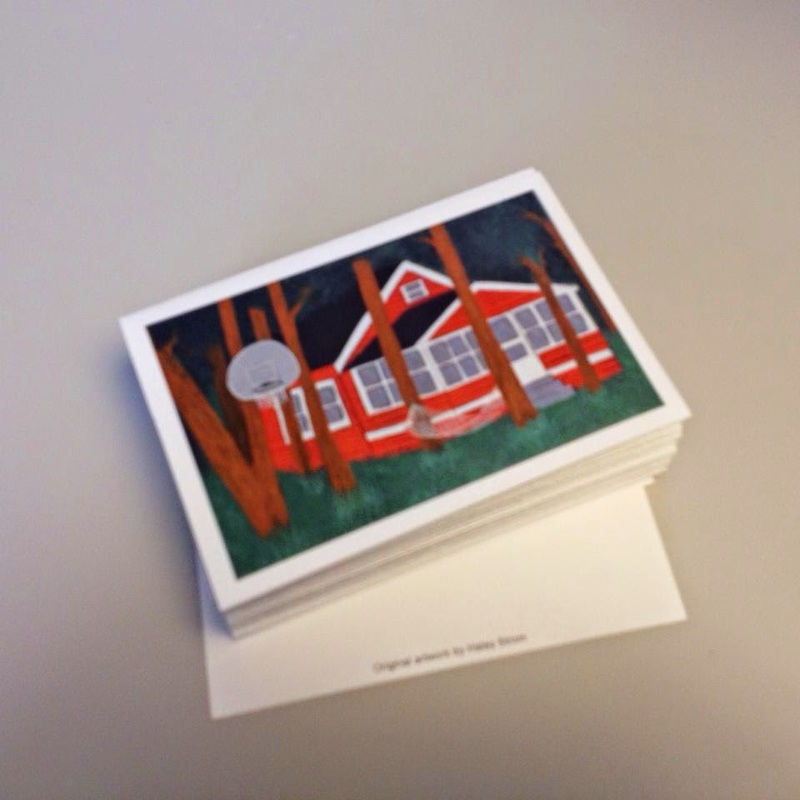 I ended up putting the photo in a document and adding "Original painting by Haley Strom" on the back and sent it off to Kinko's to get it printed (like I did with these shower invites and thank you cards). I cut and folded them myself and wrapped them up for Christmas. I didn't get a great photo of the cards (story of this blog), but here are some out of focus phone pictures so you get an idea of what they look like. I'm printing off some more soon, so I'll get some better pictures of them then. My aunt says she loves them and even sent me one as a thank you card.